Texan Girl Talks: Oh Hi! I hope everyone had a Merry Christmas. I figured I'd do a post because it's really been a bit. December was a whirlwind, and I'm glad it's winding down a bit. It's totally weird blogging right now. Do I still remember how to ramble? Of course. I'll show you some pictures of our Christmas, which I totally meant to post 3 days ago, but whatever. Yep. 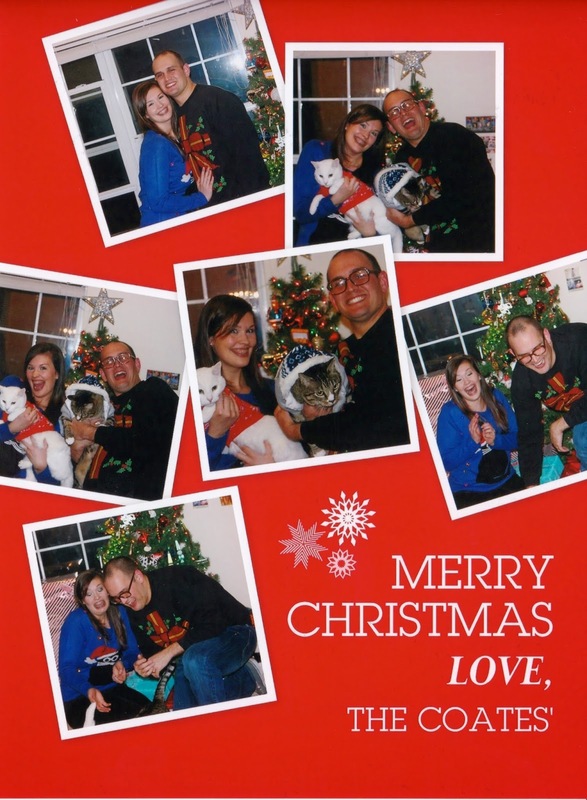 Ugly sweaters + Cats in sweaters = THE WORLDS BEST TACKY CHRISTMAS CARD! I was pretty proud of it, I just wished we would have put the year on it. Dang. That will have to wait until next year. I have to say it was a very nice, serene Christmas. No traveling, just hanging out with the cats and eating. Nothing fancy. We made this. 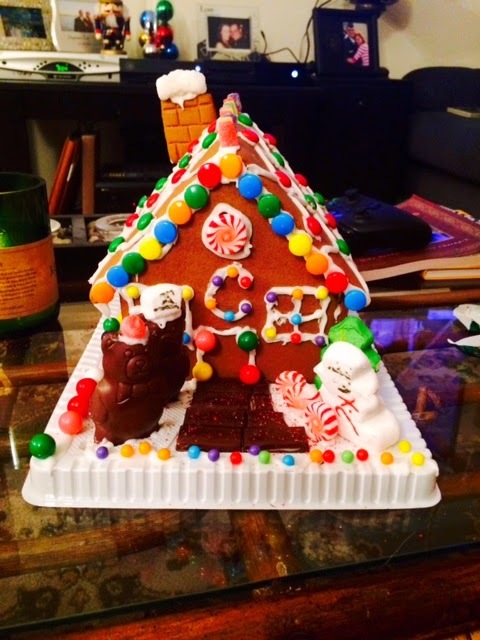 Yes, we are still married, after handcrafting this winter gingerbread wonderland. Only 2 meltdowns while putting this together, my OCD gets in the way. ALOT. 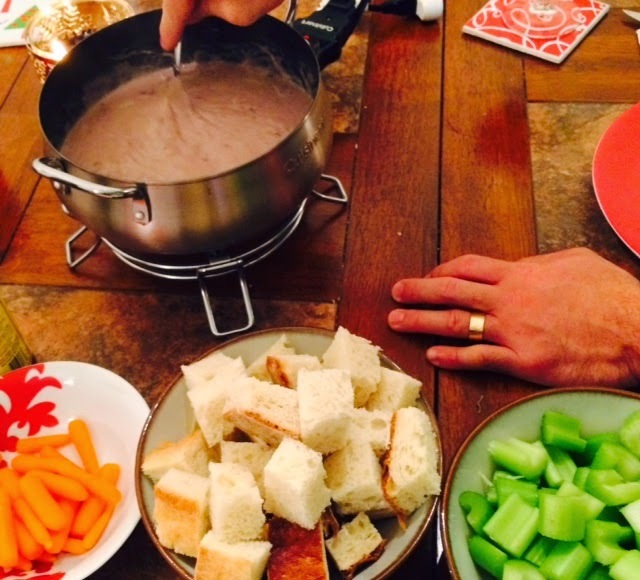 We ate fondue on Christmas Eve. It was super yummy, but my goodness it was shameful eating that much cheese. We got a little carried away. I think we are going to move this tradition to Christmas dinner next year. For Christmas dinner we ordered a whole bunch of Chinese food. We ate on that for two days it was so much food. We watched all the Christmas movies you could imagine a couple of times this season. I hope you and your family had a wonderful Christmas excuse me while I get back to studying for my nursing boards. I can't wait until the day I don't have to open up another NCLEX book. Ps. I just had to.